With all the research studies conducted over the past several decades repeatedly establishing a causal link between firefighting and cancer, and since firefighters are considered heroes by most people's definition, one would assume they'd get all the support they need when stricken with occupational cancer. Unfortunately, reality paints a different picture. Local jurisdictions have a tendency to resist granting workers' compensation benefits to firefighters when they are diagnosed with occupational cancer. For this reason, it seems as though every time we turn around these days, there's another news story (here's an example) about a political war being waged in some state or other over whether or not the hands of local jurisdictions within that state should be forced to do so through presumptive legislation. Although 34 states have presumptive laws in place for firefighters (meaning it is presumed that certain cancers were caused by firefighting unless it can be proven otherwise), there have been instances in which zero funding is provided to actually make it happen. Further, jurisdictions have been known to fight against granting a firefighter his or her rightful benefits even when his or her specific cancer is on the state's presumptive list of covered cancers, dragging the firefighter through a legal battle and demanding that the firefighter produce substantial evidence that can prove the exact fire(s) which caused the cancer. This puts firefighters under a great amount of duress on top of what they're already experiencing as they struggle to obtain proper medical care and to maintain the ability to still support themselves and their families. 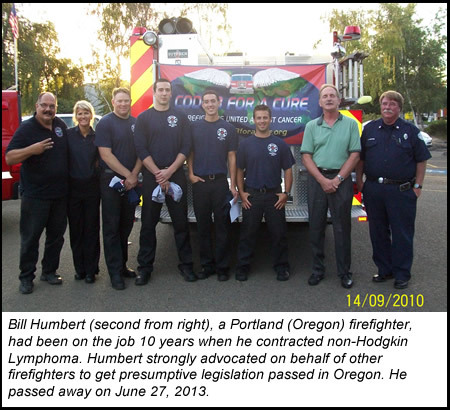 According to an article written by the International Association of Firefighters (IAFF), Dave Potter had been a dedicated firefighter in Puyallup, Washington, for 16 years in 2005 when he learned he had T-cell lymphocytic leukemia. Potter contracted the cancer as a result of dangerous toxins he had been exposed to on the job. Even though Washington had enacted presumptive laws, Potter died before he received the treatment he needed. "He died because he needed a bone marrow transplant, and could not afford the $60,000 cost of the procedure," explained Kevin Rojecki, at that time the legislative liaison for the Washington State Council of Firefighters. "He died because his workers' compensation claim was denied." See article in the Insurance Journal. Unfortunately, these are not just a few isolated cases of firefighters struggling to get help when stricken with occupational cancer, and not all firefighters have workers' compensation coverage available to them as an option. For example, many states lack coverage for volunteer firefighters, which comprise 70% of firefighters in the U.S.